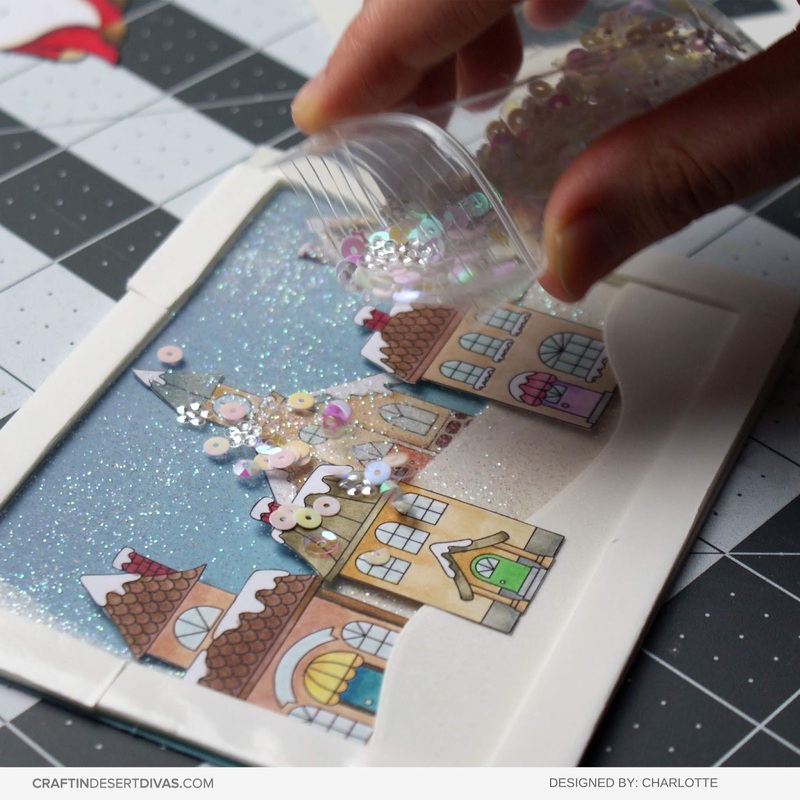 This week at Craftin Desert Divas we're focusing on creating interactive cards. 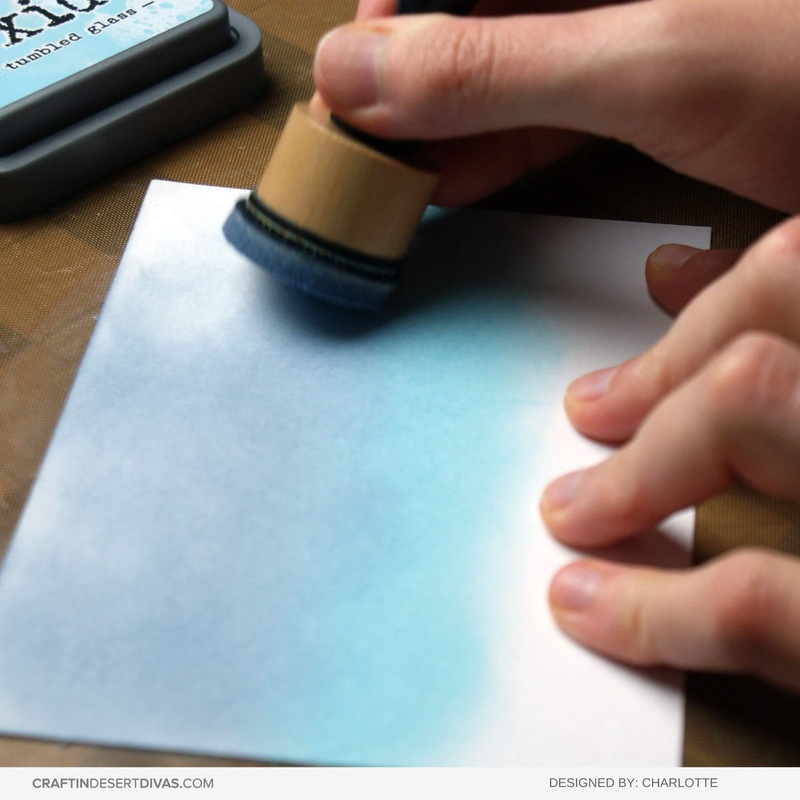 There are may different kinds of interactive cards - box cards and popup cards, waterfalls and sliders, and of course shakers. For this blog post I created a wintry double shaker card. I began by printing out all the images I wanted to use for this card. 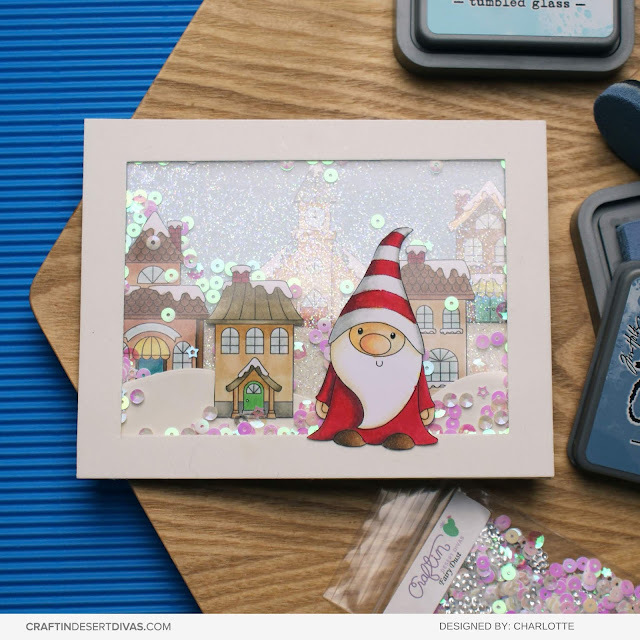 I used images from the Winter Village set as well as a Winter Gnomeo. I printed and coloured more images than I ended up using, as I wasn't entirely sure how I wanted my finished design to look, and I wanted to be sure that I would have enough. I'd rather have too many than too few! I used my Spectrum Noir Illustrator Markers to colour in all of my images. I went for a variety of browns and greys for the roofs and walls of the buildings. I chose brighter colours for the doors and awnings, and used a pale blue to add a hint of colour to the windows. For the Winter Gnomeo I decided to give him a Christmas-y look with a red and white outfit. I only have one red marker, so to add depth and shading to the red I actually bought in some green markers. Green is red's complementary colour, being opposite on the colour wheel, and combining them gives a hint of brown to the red, which works nicely for shading. Using too much of the green could create mudiness though. Once I'd completed all of my colouring I carefully fussy cut each of them out, and then set them aside whilst I worked on my background and other scene building. I did some ink blending on some 5 1/2" by 4 1/4" watercolour card to create the sky for my background. I chose to use Tumbled Glass and Stormy Sky Distress Oxides to give a wintry feel to the sky. Most of the Tumbled Glass portion actually ended up being covered in the final card, but I think it helped to add depth to the sky anyway. As well as my sky background I created a couple of snowy hills using the Outdoor Landscape Diesand some white glitter card stock. 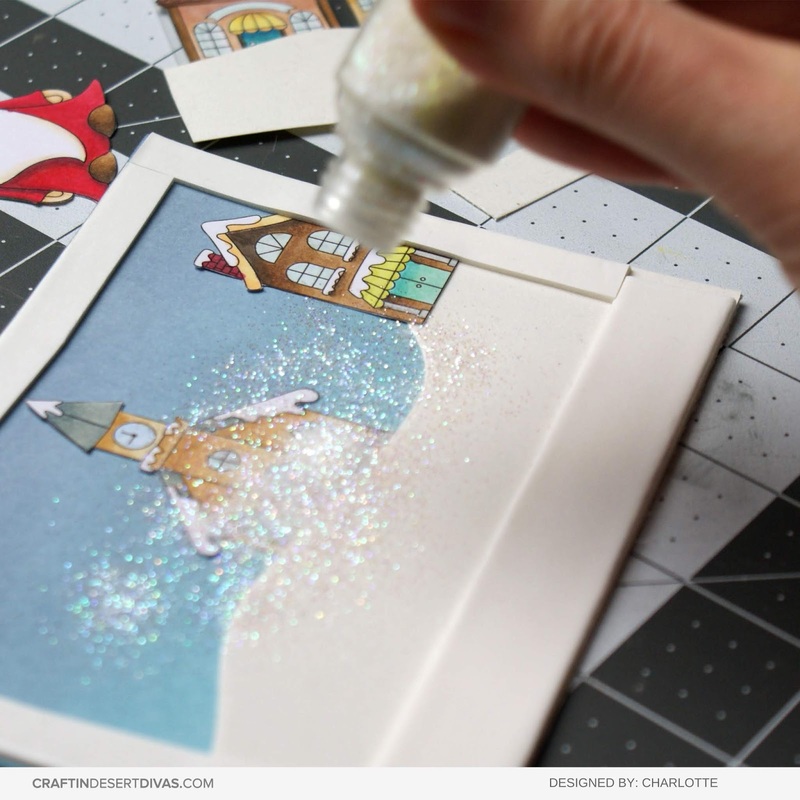 I used the same white glitter card stock to cut a frame to go on the front of my card. Whilst I had my paper trimmer I went ahead and cut my acetate windows too. I needed two windows, one for each of the shaker layers, and I cut these to the same size as my background panel. This way my finished shaker would be the same size as my finished card front. Next I started assembling everything. 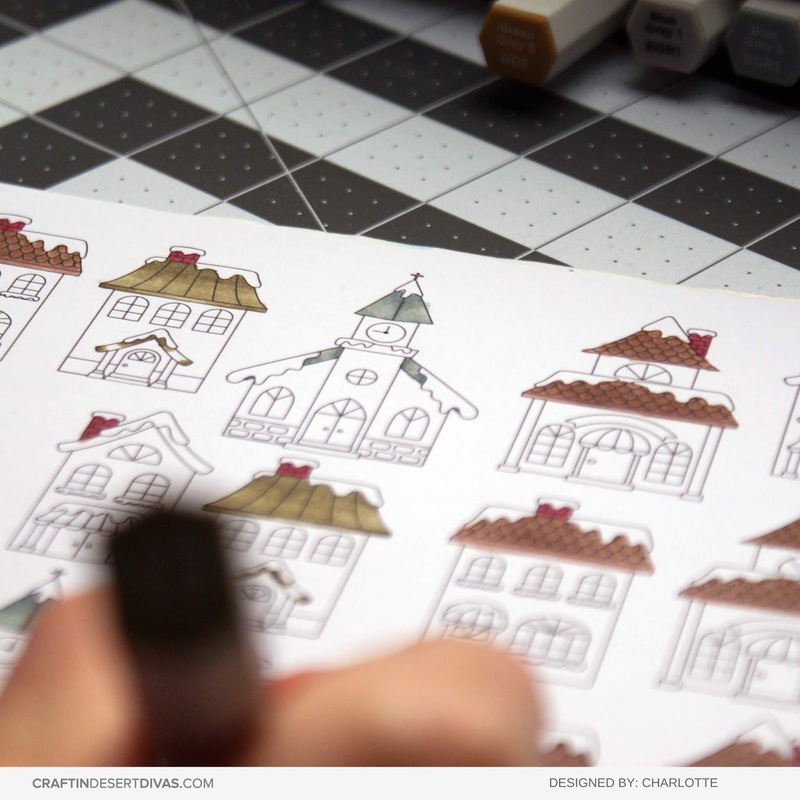 I adhered my larger die cut hill directly to the background panel, and added a couple of the buildings onto it. I then added a frame of foam tape all the way around. I made sure the foam tape would be hidden behind my frame and front elements of the scene. I then added some white iridescent glitter to the open area to create my first shaker layer. As before, after having added my shaker filling I removed the backing from my foam tape. I then added my final acetate layer and frame onto the top. I finished off the shaker by adhering my Winter Gnomeo into place. 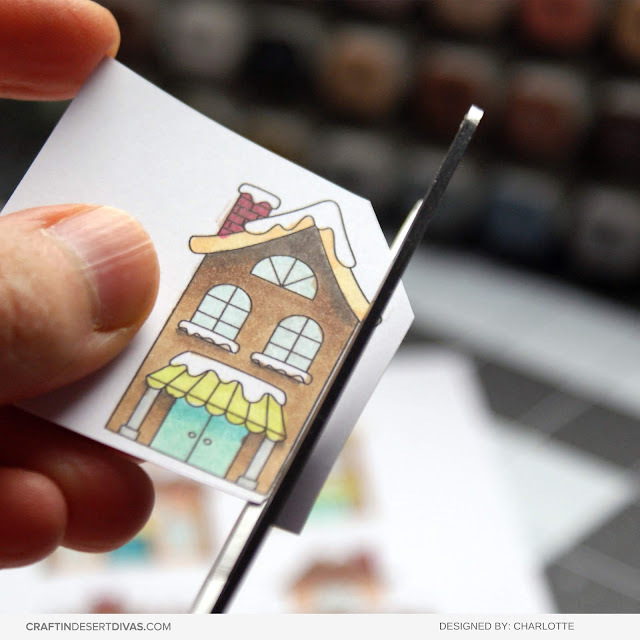 Finally I adhered the shaker to my white card base, completing the card.Craftin Desert Divas blog throughout the week for further interactive card inspiration from the team. wonderful, it's a lovely scene!! !